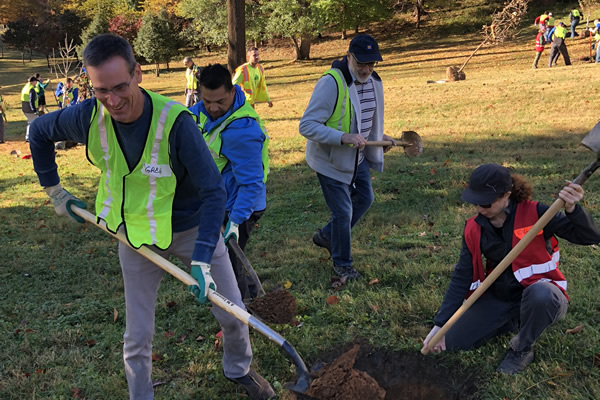 This month, the D.C. Front Runners commemorated the 30th anniversary of their Memorial Grove by gathering about 40 volunteers to plant new trees. The planting was a group effort with contributions from the D.C. Front Runners, Casey Trees, Veteran Compost and Open City Diner. In the 1980s, HIV/AIDS took the lives of many D.C. Front Runners and in 1988, the club laid an AIDS quilt panel on the National Mall in honor of its lost members. That was followed by the planning of a memorial grove of flowering trees in collaboration with the National Park Service. They chose a location along their weekly Saturday morning running/walking route. Starting from the Taras Shevchenko statue, the D.C. Front Runners Memorial Grove is located just over the second footbridge, on the right, near the Calvert/Connecticut Avenue entrance to Rock Creek Parkway by the Taft Bridge. The Front Runners started with five trees and by the mid-‘90s, the trees and shrubs were well rooted and healthy. More club members died in the ‘90s, some of causes other than AIDS, and the Front Runners expanded the original concept of the Grove to memorialize all members who had died. On the Grove’s 20th anniversary in 2008, the D.C. Front Runners planted 10 new trees and took care of them during the following two years until they were strong enough to grow on their own. This month on the 30th anniversary, they renewed their commitment by planting an additional 10 trees that were selected, just like the trees before them, because they are native species that belong in the local ecology. This year’s planting was three Dogwoods, two Bur Oaks, two Eastern Redbuds, two Fringetrees and one Hackberry. D.C. Front Runners walking coordinator, Larry Lee, was one of the club members who provided maintenance and watering to the trees in 2008. His service will continue following the most recent planting. Casey Trees donated the trees and worked with the National Park Service to get the permits, planned the schedule for delivering the trees and created a staging area. They also provided volunteers along with the Front Runners who will provide watering and weed pulling during the first two years to assure that the trees develop a strong root system. D.C. Front Runner Rob Geremia mentioned one runner who was a recent reminder of the significance of the Grove. Alan T. died suddenly in December, 2016 shortly after marrying his husband.